Angie’s List has been around for a while. Those who know and use it swear by its utility while others struggle to find a use for the site with the introduction of simpler, public-er and ‘free’ sites of the same variety, such as Yelp. Should you make use of the List and how reliant on it should you be? Here’s an overview of the good and bad sides. Back in the day, Angie’s List was like the be-all-end-all of review sites: if you weren’t using it, you probably weren’t reading a lot of reliable customer reviews. Over time, though, enough similar services popped up to make quite a few people consider the List obsolete. Perhaps the biggest thing Angie’s List still has going for it – and what makes it so great if you’re a contractor – is that it looks out for business owners. Whereas on sites like Yelp or FourSquare business owners are at the mercy of dissatisfied customers even if they didn’t do anything wrong, Angie’s staff goes above and beyond to help out businesses and protect them from unwarranted negative reviews. If someone slams you with a negative review on the site, the staff will get in touch with the person and ask them what’s what, trying to form a bridge between you and the disgruntled customer. This is a tremendous perk of the site and one that other sites of the kind are clearly lacking – even a single negative review can do plenty of harm to a business, especially one that is still growing. Indeed, the whole atmosphere at Angie’s List is what lets the site continue rising above its competitors in a lot of cases: one gets the feeling of being in a tightly-knit community where people look out for one another (reviewers and contractors alike) as opposed to a free-for-all forum environment found on similar sites. With that said, Angie’s list is not without its downsides, and it pays to consider both sides of the coin. In a sense, the same things that make Angie’s List work can also make it seem somewhat inhospitable: new business owners can get the feeling of being shut out by older and more established businesses with a presence on the site. In fact, one could say that the very existence of these sites presents a major issue for business owners who have no choice but to participate in the game and hope for the best. Another issue one could name is the site’s relatively-dwindling popularity. Sure, the List isn’t going anywhere, but its mechanics and difficulty of access have made it less popular in comparison to competitors (even if one could argue that Angie’s list is more effective at what it promises to do). Therefore, your efforts to establish a presence on the site and get good reviews could end up not amounting to much if people simply flock to a more-popular site for reviews they consider less biased. Coupon mailers are, as always, a mixed bag of results. Some hate them, others love them: some swear by their efficiency while others ridicule the notion and find it a form of spam, and a thoroughly outdated one at that. As a budding business owner, where should you stand on the use of coupon mailers? In order to achieve the desired effect with your coupon mailers, you need to be able to offer something up. No, the blessing of your services isn’t enough – your customers need to feel as if they’re getting something that they wouldn’t be privy to otherwise. The trick is to achieve the aforementioned without coming off as needy for customers. No matter where you’re standing, you want your would-be clients to feel as if you can barely make room in your schedule for them – everyone associates an abundance of customers with tremendous craft, and the same is true in the opposite scenario. Say you’re an up-and-coming tree service company, or one with an established user base but nevertheless looking to expand. To get results from your coupon mailer campaign, you’ll need to target a specific area during a specific time and use a specific amount of coupons. Sounds complicated? Wait until we get into the specifics. The area you’re targeting should have an abundance of overgrown trees or tree-related issues – bottom line, the environment should be ripe for the picking with your shears. Likewise, be sure to send the coupons out during prime trimming time – people who don’t use their coupons soon after receiving them will usually throw them away and hardly remember what the deal was all about. Speaking of the deal, don’t go overboard with what you’re offering, but make sure that it’s still a good incentive. For example, 30% off during a certain period and on a certain group of services is a decent bargain – 70% off everything during the entire autumn and winter definitely makes you look like you’re struggling. Of course, there’s still the amount of coupons to figure out. No matter your strategy, you’ll want your coupons to seem fairly exclusive – after all, everyone wants to have something that others don’t. Ideally, your coupons would be mailed randomly so that those who didn’t get one end up wishing they did and possibly ask around for it, thereby creating buzz and interest in your brand. Unfortunately, skipping people in a targeted area just to appear exclusive hardly brings about the best results. Instead, try sending your coupons out in envelopes – should they end up sticking out of people’s mailboxes, it won’t look as if everyone in the neighborhood got spammed. If you’re going for a wider area, you might need to employ a coupon company to do the mailing for you. While not the most expensive service, you’ll likely end up paying a hefty sum if you don’t want your coupons sharing page space with others – therefore, it pays to test out a smaller area with ‘manual’ coupons first before starting the next great coupon mailer campaign. Depending on how you look at it, marketing has either been the same for the past century or is constantly evolving at such a rapid pace that hardly anyone can keep up. As always, the truth lies somewhere in-between the extremes: while some tried-and-true marketing practices of old are still very much in use today, you won’t really establish a presence by relying on old-timer tactics. Instead, you’ll have to update your bag of tricks with some slick new techniques and principles to sell your brand better – here are 3 great must read marketing books that will help you do just that. 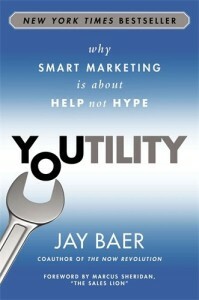 Youtility: Why Smart Marketing Is About Help Not Hype by Jay Baer: Those who follow the marketing scene undoubtedly know of Baer and his contribution to the craft. Well, his recent work on customer relations could very well be called his best – Youtility provides some amazing insights by making an effort to explain to the reader that marketing has moved on. More specifically, it’s not about hyping the product up anymore so much as getting customers to like and trust you. By coming off as a helpful entity for whom sales are secondary, you’ll actually end up selling lots more as people start treating you like a friend or family member instead of a mean old profits-hungry enterprise. No matter the type of business you’re running, Baer’s insights stand to help you a ton even if you can only apply a small fraction of them. What’s the Future of Business: Changing the Way Businesses Create Experiences by Brian Solis: In line with books that make you reconsider what you’re doing, Solis’ thought-provoking piece ponders the future of the business world and how you can better prepare for it. Solis’ formula sounds simple in theory: understand the fact that present-day customers are empowered and seek to captivate them by providing a great user experience over the long-term. Of course, putting Solis’ ideas to work won’t be as easy – creating a positive brand that customers associate with good things hardly ever is – but that’s not to say this book isn’t worth a read for every marketer or entrepreneur who likes to think outside the box. The Challenger Sale: Taking Control of the Customer Conversation by Matthew Dixon: More than a few businesses struggle with unmotivated or disinterest salespeople who are just looking to collect a paycheck. While easy to ignore when focusing on other, seemingly more important aspects of running a business, every cog in the engine serves its purpose, and having a lackluster sales team can kill your profits in no time. Dixon’s book tells you how to move away from having a sales team whose leads can’t wait to hang up and towards individuals who play the part by coming off as outgoing experts who let customers know why they absolutely need your services. If you always wanted to do more with your sales team and have the nagging feeling that they aren’t doing close to what they could, make sure to study this book and pass it along to every individual member of the team. Y. Marshfield Marketing has a new home! My writing name is Y. Marshfield and now I have my marketing blog!